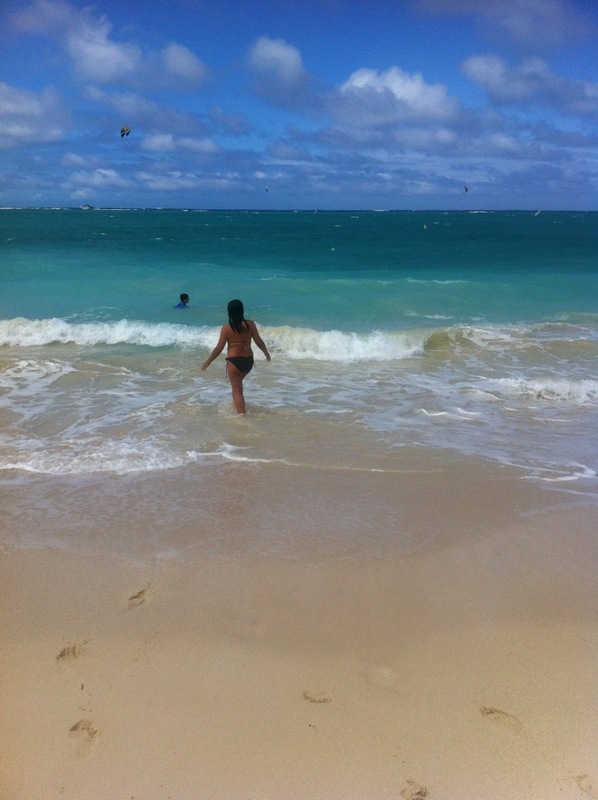 I am back from visiting family in Hawai’i, where we were surrounded by color: soft blues and greens, mostly. Coming home to Boston wasn’t as dismal and grey as it usually is, thanks to the earlier-than-usual heatwave that made everything bloom while we were away. And Boston is currently home to two very colorful exhibitions at the Institute of Contemporary Art (ICA), and the Museum of Fine Arts (MFA). As a constant presence in our lives, we tend to take color for granted. Yet color is all the rage these days. Color blocking as fashion trend is the bane of black-clad urban women everywhere. Sir Isaac Newton invented the color wheel, “a logically arranged sequence of pure hues” in 1666. Humans seek logic in everything we see. We look for patterns and sequences in design, art, and in life, to help us predict what will be. Yet how to make sense of the nonsensical, the fantastic, the totally random? We can turn to art to show us the way. You still have a few days to catch a thought-provoking show, Figuring Color: Kathy Butterly, Felix Gonzalez-Torres, Roy McMakin, Sue Williams, now at the ICA until May 20. Color has so much meaning. It’s a universal language we instinctively understand from a very young age. The aptly named Kathy Butterly’s (b. 1963) ceramic forms are playful, sensual, and engrossing. They also look pretty damn tasty. Maybe I’ve been hitting the cupcake truck a little too hard lately, but butter creme frosting (and cupcakes) come to mind when I look at these diminutive, rich forms. Some call Butterly’s work the ceramic cousin of Robert Crumb, the 1960s subversive graphic art genius. Butter, crumbs…I can’t get baked goods out of my mind. Cupcakes aside, how do we rationalize the violence we see, or the sadness we experience? Artists help us process things that are otherwise hard to explain, or that are simply inexplicable, through their art. 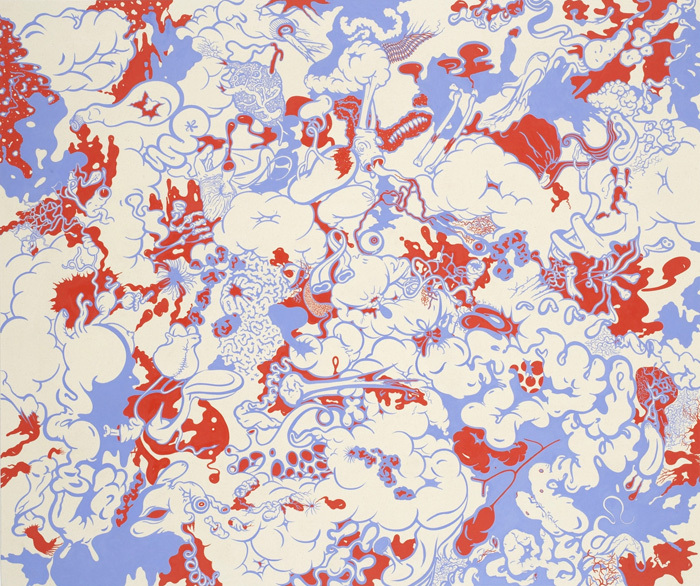 Sue Williams’ (b. 1954) series on war and capitalism, Project for a New American Century, feature comic-book-on-acid style pieces that hit you on a visceral level with color and form. As you look closer, you get sucked into an unending, swirling nightmare vision of war: the blood, the violence, the random spurting body parts. You feel the colors, and the political message they convey, more than you see them. 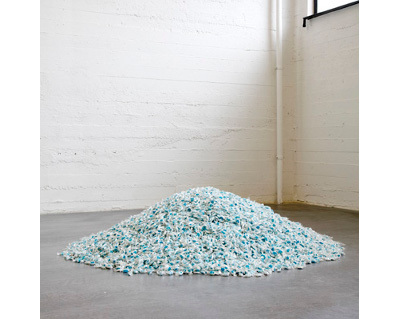 In his piece Untitled (Lover Boys), a sculpture made of hundreds of blue and white candies poured onto the ICA’s concrete gallery floor, is a memory of love lost too soon. The sculpture’s “ideal” weight (you’re invited to take a piece, and fleetingly share something sweet) is 355 lbs., the combined weight of the artist and his life-partner, who died of AIDS. Alex Katz (b. 1927) manages to infuse color into the grayest of gray days that New Englanders know so well. 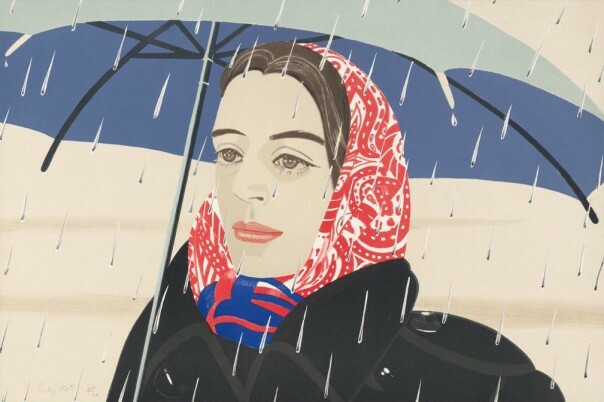 His show, Alex Katz Prints, is at the Museum of Fine Arts through July 29th. A master of color blocking, Katz uses color to define his subjects, capturing their essence by distilling their images and surroundings into the most basic, intense, and elegant forms of saturated blocks of color. Check these two great shows out, and enjoy. Both are worth savoring.